The Bronx-born rapper made history at the 2019 Grammy Awards on Sunday night by picking up the trophy for Best Rap Album, becoming the first solo female rapper to do so in the category's 20-plus year history. Lauryn Hill won as a member of the hip-hop group Fugees in 1997. 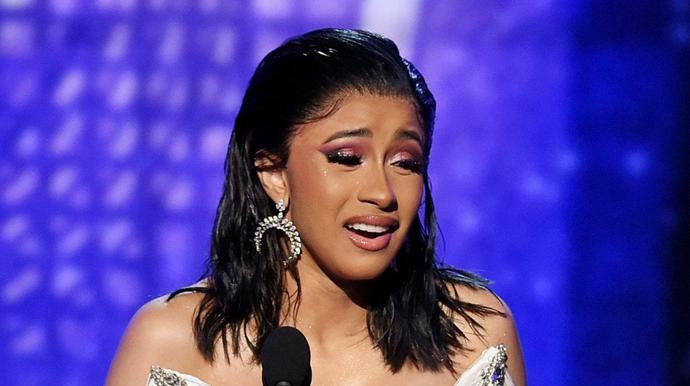 It's not like Cardi B even needed the award given how she'd already shut down the red carpet in a vintage couture gown, followed by a show-stopping performance of her new single "Money." But nothing could compare to the raw emotion she showed in her acceptance speech. "The nerves are so bad. Maybe I need to start smoking weed," Cardi said through the tears, while husband and rapper Offset stood by her side. "I just want to say thank you to everybody that was involved." "I'm not just saying thank you because she's my daughter. It's because, you know, when I found out I was pregnant, my album was not complete, like three songs that I was for sure having," she said on stage. "And then you know, you know how it was, we was like, we have to get this album done so I could still do videos while I'm still not showing. And it was very long nights." Heading into the evening, Cardi B was nominated for seven awards across major categories, including Album of The Year and Record of the Year for her chart-topping single, "I Like It."